Nothing says morning like Cinnamon Rolls. Just the right blend of cinnamon brown sugar filling, together with tender golden dough and a sweet honey glaze. Right out of the package, they’re the perfect anytime snack. Warmed in the microwave, they’re perfection. 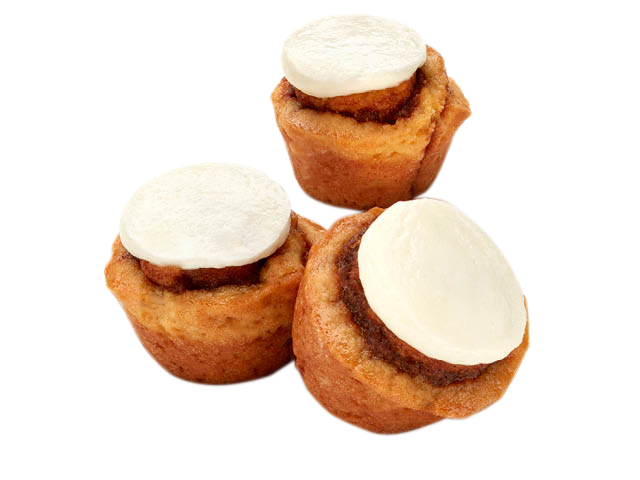 Choose honey-glazed or topped with cream cheese icing-then, try closing your eyes while you enjoy the two-bite® taste. 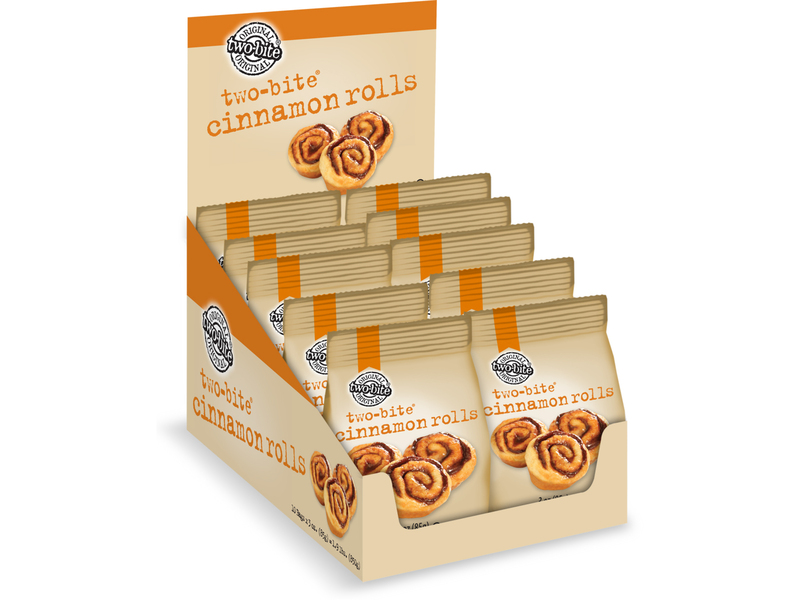 Delicious mini cinnamon rolls, packaged up in a perfect grab and go individual sized bag. Now you can enjoy them anywhere. 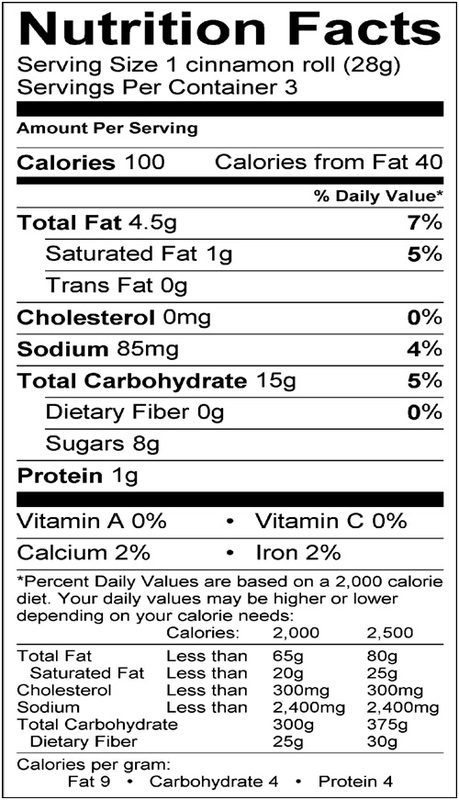 INGREDIENTS: ENRICHED WHEAT FLOUR (WHEAT FLOUR, NIACIN, REDUCED IRON, THIAMINE MONONITRATE, RIBOFLAVIN, FOLIC ACID), SUGAR, NON-HYDROGENATED VEGETABLE OIL MARGARINE [SOYBEAN AND MODIFIED PALM OILS, WATER, SALT, WHEY POWDER, SOYBEAN LECITHIN, MONO AND DIGLYCERIDES, NATURAL FLAVOR, CITRIC ACID, VITAMIN A PALMITATE, VITAMIN D3, COLOR (ANNATTO)],GLAZE [WATER, SUGAR, GLUCOSE, HONEY, CITRIC ACID, ARTIFICIAL FLAVOR, AGAR, PECTIN, SODIUM ALGINATE, SODIUM BENZOATE (PRESERVATIVE), MONO AND DIGLYCERIDES], PARTLY SKIMMED MILK, CINNAMON, POTATO STARCH, MOLASSES, LEAVENING (SODIUM ACID PYROPHOSPHATE, SODIUM BICARBONATE, CORN STARCH, MONOCALCIUM PHOSPHATE, CALCIUM SULFATE), MONO AND DIGLYCERIDES, SALT, VINEGAR. 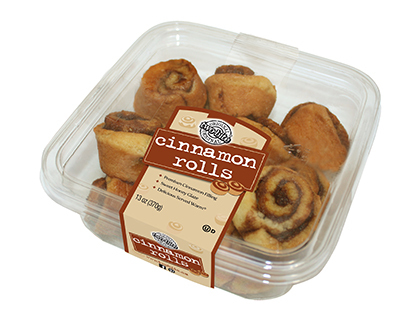 Delicious right out of the pack or served warm, our delicious cinnamon rolls are made with real cinnamon layered throughout, and then baked to a golden brown. The perfect treat! ENRICHED WHEAT FLOUR (WHEAT FLOUR, NIACIN, REDUCED IRON, THIAMINE MONONITRATE, RIBOFLAVIN, FOLIC ACID), SUGAR, NON-HYDROGENATED VEGETABLE OIL MARGARINE [SOYBEAN AND MODIFIED PALM OILS, WATER, SALT, WHEY POWDER, SOYBEAN LECITHIN, MONO AND DIGLYCERIDES, NATURALFLAVOR, CITRIC ACID, VITAMIN A PALMITATE, VITAMIN D3, COLOR (ANNATTO)], GLAZE [WATER, SUGAR, GLUCOSE, HONEY, CITRIC ACID, ARTIFICIAL FLAVOR, AGAR, PECTIN, SODIUM ALGINATE, SODIUM BENZOATE (PRESERVATIVE), MONO AND DIGLYCERIDES], PARTLY SKIMMED MILK, CINNAMON, POTATO STARCH, MOLASSES, LEAVENING (SODIUM ACID PYROPHOSPHATE, SODIUM BICARBONATE, CORN STARCH, MONOCALCIUM PHOSPHATE, CALCIUM SULFATE), MONO AND DIGLYCERIDES, SALT, VINEGAR. MAY CONTAIN TRACES OF EGG, PECANS, WALNUTS AND ALMONDS. 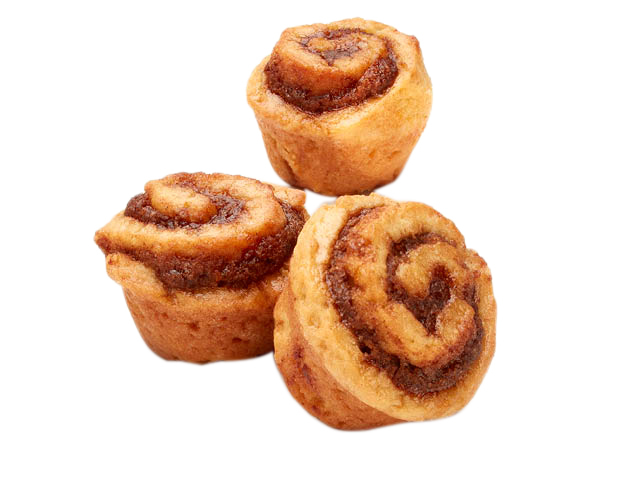 Delicious cinnamon rolls are made with real cinnamon layered throughout, and then baked to a golden brown. Great right out of the pack, or served warm. INGREDIENTS: ENRICHED WHEAT FLOUR (WHEAT FLOUR, NIACIN, REDUCED IRON, THIAMINE MONONITRATE, RIBOFLAVIN, FOLIC ACID), MARGARINE [SOYBEAN AND MODIFIED PALM OIL, WATER, SALT, WHEY POWDER, SOYBEAN LECITHIN, MONOGLYCERIDES, NATURAL FLAVOR, VITAMIN A PALMITATE, VITAMIN D3, COLOR (ANNATTO)], SUGAR, GLAZE [WATER, SUGAR, GLUCOSE, HONEY, CITRIC ACID, ARTIFICIAL FLAVOR, AGAR, PECTIN, SODIUM ALGINATE, SODIUM BENZOATE (PRESERVATIVE), MONO AND DIGLYCERIDES], PARTLY SKIMMED MILK, INVERT SUGAR, CINNAMON, POTATO STARCH, LEAVENING (SODIUM ACID PYROPHOSPHATE, SODIUM BICARBONATE, CORN STARCH, MONOCALCIUM PHOSPHATE, CALCIUM SULFATE), MONOGLYCERIDES, MOLASSES, SALT, VINEGAR. 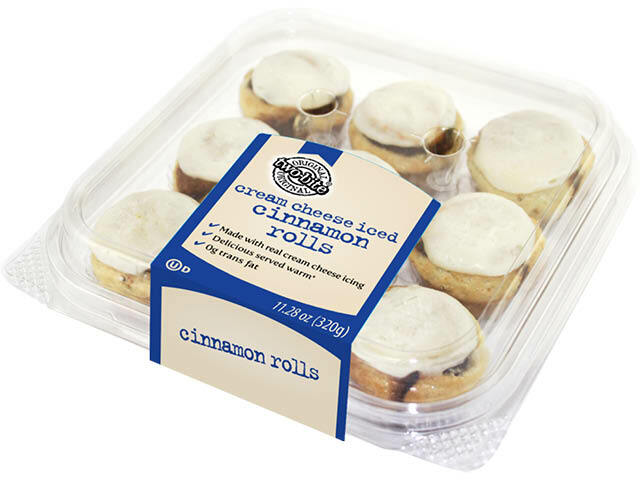 Delicious mini cinnamon rolls, topped with a rich cream cheese frosting. 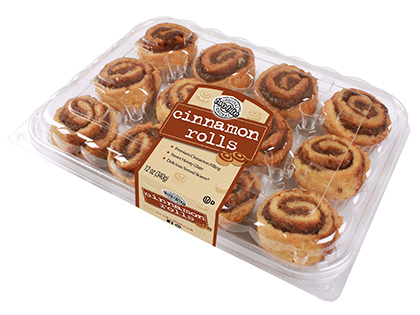 INGREDIENTS: CINNAMON ROLL: ENRICHED WHEAT FLOUR (WHEAT FLOUR, NIACIN, REDUCED IRON, THIAMINE MONONITRATE, RIBOFLAVIN, FOLIC ACID), SUGAR, NON-HYDROGENATED VEGETABLE OIL MARGARINE [SOYBEAN AND MODIFIED PALM OILS, WATER, SALT, WHEY POWDER, SOYBEAN LECITHIN, MONO AND DIGLYCERIDES, NATURAL FLAVOR, CITRIC ACID, VITAMIN A PALMITATE, VITAMIN D3, COLOR (ANNATTO)],GLAZE [WATER, SUGAR, GLUCOSE, HONEY, CITRIC ACID, ARTIFICIAL FLAVOR, AGAR, PECTIN, SODIUM ALGINATE, SODIUM BENZOATE (PRESERVATIVE), MONO AND DIGLYCERIDES], PARTLY SKIMMED MILK, CINNAMON, POTATO STARCH, MOLASSES, LEAVENING (SODIUM ACID PYROPHOSPHATE, SODIUM BICARBONATE, CORN STARCH, MONOCALCIUM PHOSPHATE, CALCIUM SULFATE), MONO AND DIGLYCERIDES, SALT, VINEGAR. ICING: ICING SUGAR, CREAM CHEESE (MILK INGREDIENTS, BACTERIAL CULTURE, SALT, CAROB BEAN GUM), NON-HYDROGENATED VEGETABLE OIL MARGARINE [SOYBEAN, CANOLA, PALM AND MODIFIED PALM OILS, WATER, SALT, WHEY POWDER, SOYBEAN LECITHIN, MONOGLYCERIDES, NATURAL FLAVOR, VITAMIN A PALMITATE, VITAMIN D3, COLOR (ANNATTO)], MALTODEXTRIN, NON-HYDROGENATED VEGETABLE OIL SHORTENING (CANOLA, PALM, MODIFIED PALM AND PALM KERNEL OILS), GLUCOSE, SKIM MILK POWDER, MONO AND DIGLYCERIDES, WATER, MODIFIED CORN STARCH, GUAR GUM, MODIFIED POTATO STARCH, XANTHAN GUM, NATURAL FLAVOR, POTASSIUM SORBATE (PRESERVATIVE), POLYSORBATE 60.